I subscribe to Rodale Wellness and receive their daily newsletter for ideas and inspiration for living a healthy life. This particular article stood out as an excellent and very relevant topic for Livinginthemoment2015. The idea of this piece is instead of focusing on negatives, make positive changes in your life. Practice acts of kindness. In the next seven days complete at least one random act of kindness. 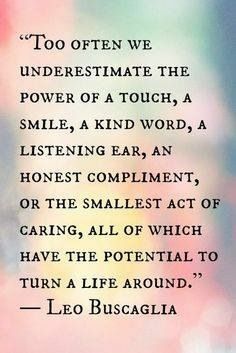 But, not just any act of kindness, it must be an unsuspecting random act of kindness. Holding doors, giving up your seat for the elderly, and picking up trash on the street does not count as completed homework. You should do those things all the time! 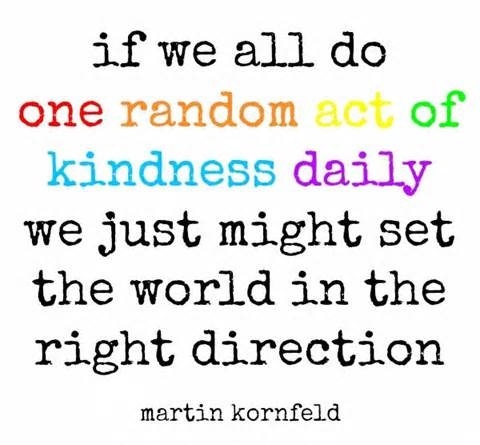 An example of an unsuspecting random act of kindness could be paying the toll for the vehicle behind you, picking up a round of coffee for people you always see in the morning on the way to work, or giving your jacket to a runner that looks cold during early morning hours. But here’s the catch: Please do not tweet, post, or brag about anything you do for this homework assignment. Bragging about doing nice things defeats the purpose of that very same act. The only two people that will know the exact details of what you did is you and the person that you surprised. Now go make your city and the world a better place! I’m up for the challenge, how about you?